The Vancouver Condo Buzz » Boutique Port Coquitlam LA VIA Condos in Tri-Cities Real Estate Market Featuring 1 & 2 Bedroom PoCo Apartments Now Selling! NOW SELLING! An intimate collection of homes is now selling at the new Port Coquitlam real estate development called La Via Condos. The way to parks, trails and greenspace, to shopping dining and community. The way to world-class transportation, downtown access and everything at your fingertips. The way to a home with value that lasts, that stands out and convenience that makes life easy. These are the new Port Coquitlam La Via condos for sale. The project site is located at 2351 Kelly Avenue Port Coquitlam BC. 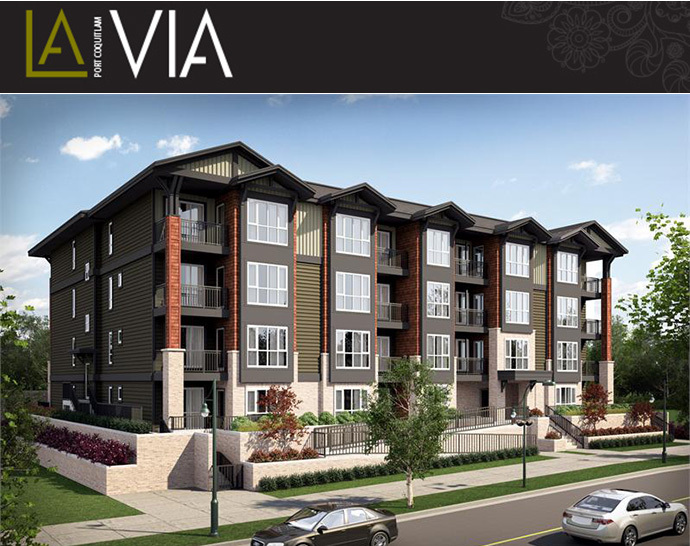 La Via PoCo condos are brought to the Tri-Cities market by Circadian Developments Ltd and is scheduled for completion in 2014. There are only 34 boutique condominium residences in this entire project. The floor plans at La Via Port Coquitlam condos range in size between 510 square feet (five hundred and ten) to 985 square feet (nine hundred and eighty five). The ceiling heights are approximately nine feet depending on the unit and level. The architecture is by award winning firm Atelier Pacific Architects. According to their initial marketing, both parking and storage lockers are included in the purchase price for a limited time offer only. For more information about the presale Port Coquitlam La Via condos, please contact them at 604.475.5100 or you can visit the condominium project web site located online at www.laviapoco.com (only a splash page right now). Or you can also visit the presentation sales centre located at 2351 Kelly Avenue Port Coquitlam BC. The boutique 34 unit development features floor plans that range between 1 and 2 bedrooms (many of them have dens and all have outdoor living spaces). The contemporary architecture is both appealing as it is timeless and the large windows will allow lots of natural light into your living spaces. The Port Coquitlam La Via condo building will be centrally located close to major shopping centres, big box retails as well as eclectic boutique stores in and around the Tri-Cities real estate neighbourhood. In addition, you can enjoy international cuisine with lots of different choices for restaurants, cafes and eateries nearby. Close to both elementary and secondary schools, the presale PoCo La Via condos for sale will also be within walking distance to a number of beautiful green spaces and urban parks that Port Coquitlam is so well known for. Within minutes are recreational venues such as ice skating rinks, fitness centres, outdoor recreation and a lot more. You can also jump on the West Coast Express to get to downtown Vancouver. La Via means ‘The Way’. The way to parks, trails and greenspace, to shopping, dining and community. The way to world class transportation, downtown access and everything at your fingertips. The way to a home with value that lasts, style that stands out and convenience that makes life easy. The way to a life with it all is within your grasp at the new La Via PoCo condos for sale right now! Brought to you by Circadian, the La Via Port Coquitlam condos are now selling at 2351 Kelly Avenue, PoCo BC. Stay tuned for more details as they are released. You can get more information by asking a sales representative today! One of the floor plans at La Via PoCo condos is Layout C which is a 905 square foot residence with a patio of 255 square feet (for ground floor unit) or 65 square foot balcony (on floors 2 to 4). Remember that the 4th floor is the penthouse level. Port Coquitlam La Via floor plan C features 2 spacious bedrooms plus a full sized den (not like your typical storage locker den) plus 2 full bathrooms. The master ensuite is connected directly from the master bedroom and features an oversized shower and single vanity. The second bathroom has a shower/tub combo. There’s tonnes of interior storage space in addition to a laundry closet with stacked washer and dryer. The master bedroom also has beautifully large windows for lots of natural light and views. Please note that the dimensions, sizes, specs, layouts and materials are approximate only and subject to change without notice at La Via Port Coquitlam condos.